Although I typically blog about my authors’ books, today I am actually writing about my own. 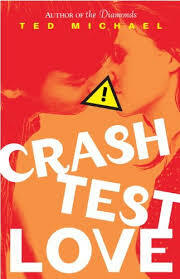 On June 8th, my second novel for teens, Crash Test Love, was released. I truly believe that having the firsthand experience of publishing a novel—finishing that elusive first draft, going through rounds of revision with a skilled editor, worrying about the cover, reviews, and all that jazz—only makes me a more insightful and skilled agent, and I am incredibly proud to share this novel with all of you. I am happy to invite any Upstart Crow blog readers who live on Long Island to a reading I will be doing at the Barnes and Noble in Carle Place tonight at 7pm. Congrats, Ted! I look forward to reading it! Congratulations, Ted! I can’t wait to read the book, and wish I could be at the event tonight. Have a great time! Oh. My. God, Ted. You are a big SECRET KEEPER! Congratulations, belatedly, and I can’t wait to read it! I will have to add that to my to-read pile.